In December the landscape can start to look bleak, as the green seems to gradually leach out of nature. The bare branches of broad-leaved trees starkly reach up to the sky and spring seems a long way away. Of course some of our trees and shrubs are evergreen and retain most of their leaves year round. Perhaps this why there are ancient traditions in the world’s northern latitudes of bringing samples of this greenery indoors during the winter. Choosing boughs and even entire trees to decorate our indoor spaces may speak to a deep human need to remind ourselves that nature is only resting during the long winter. The custom of cutting down and decorating a tree for Christmas originated in Germany. When Queen Victoria married Prince Albert, a German, the custom spread to the British Empire. In 1841 a tree at Windsor Castle was hung with candles and other decorations and a craze was born that has since spread across much of the world. In 1850 writer Charles Dickens referred to the practice as “the new German toy”, but in fact there is evidence of pagan tree-dressing, and the use of evergreens at the winter solstice, dating all the way back to the Iron Age. By decorating homes with winter greenery countless generations of northerners around the world have reassured themselves that growth and fertility will eventually return in the spring. In Peterborough County we are lucky enough to live in a region known as an ecotone. This is where two distinctive natural communities of plants meet and mingle. To our north the cooler temperatures and thinner, less fertile soils of the Canadian Shield favour evergreen conifer forests. To the south, the deeper, richer soils and the moderating effects of Lake Ontario produce a natural ecosystem that favours deciduous broad-leaved forests. The extent and significance of this particular ecotone has only been fully appreciated and celebrated in recent years and has been dubbed the “Land Between”. Stretching in a swathe from the Ottawa valley to Georgian Bay, the area is diverse in wildlife. As a result we have a great diversity of tree species on our doorstep, including a range of coniferous species providing winter colour. You may wonder why coniferous trees keep most of their leaves during the winter, whereas broad-leaved trees drop theirs, and how is it that they have come to dominate the northern forests. 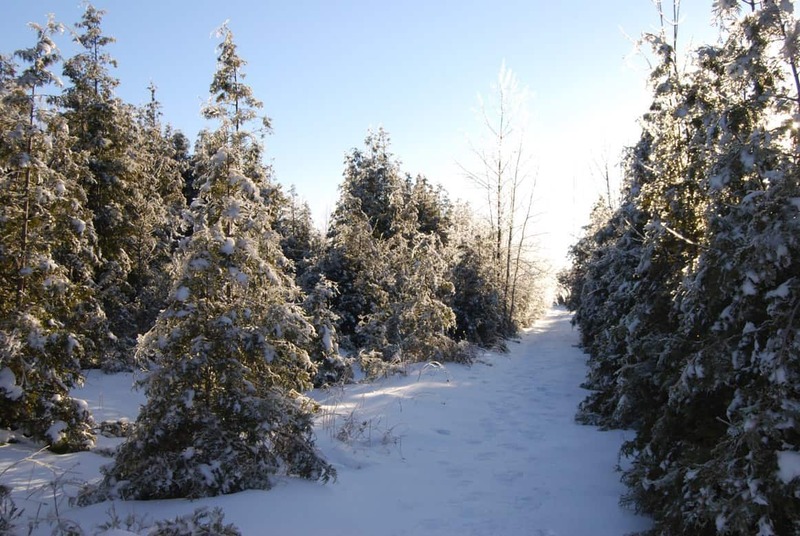 Conifers are ideally adapted to survive harsh winter conditions. Their needle-like leaves mean that they do not accumulate as much snow as a broad-leaved tree would if it retained its leaves. This minimizes the weight of snow that can build up on a tree. Coupled with rather more flexible trunks and branches this reduces the risk of conifers suffering serious structural damage from snow. The shape and form of conifers usually allows them to grow in very dense stands and this helps to reduce wind chill effects and wind damage. The leaves have a thick, waxy cuticle covering them and this helps to cut down water loss, which is important during winter when ground water is frozen and therefore unavailable to trees. In the spring, as light levels and temperatures rise, trees may start photosynthesizing at a high rate before the ground has thawed and so water conservation becomes particularly critical for survival at that time. The biggest advantage conifers gain by retaining their leaves through the winter is that they can take advantage of warmer weather as soon as it arrives, whereas broad-leaved trees have to grow new leaves first. This is particularly beneficial in northern climes where the growing season is shorter. It also avoids the loss of nutrients associated with leaf fall, which is a useful adaptation to life on the nutrient-poor soils of the Canadian Shield. Basically, the further north you go in the world the more conifers you find. Eventually you reach the world’s largest forest, the boreal, where all trees are conifers. If you plan to maintain a family tradition and follow in the footsteps of Prince Albert and our pagan ancestors, what are the environmental costs and benefits of choosing to bring a real tree into your home? If you want to be environmentally responsible should you opt for an artificial tree rather than a real one? There are many factors to consider and the answer is not a simple one. However, Ellipsos, a Montreal-based company, strategist in sustainable development, has carried out a detailed analysis of this dilemma. Its conclusion is that unless you keep your artificial tree for twenty years or more, a natural tree is the more sustainable choice. The production of real Christmas trees results in a significantly smaller carbon footprint (around 40% less CO2). Real trees use ten times fewer basic materials and much less energy to produce and get to market than artificial trees. Real trees compost when you are finished with them whereas artificial ones usually end up in landfill, often after a couple of decades collecting dust in your basement or cupboard. A real tree adds oxygen to the air and removes carbon dioxide. 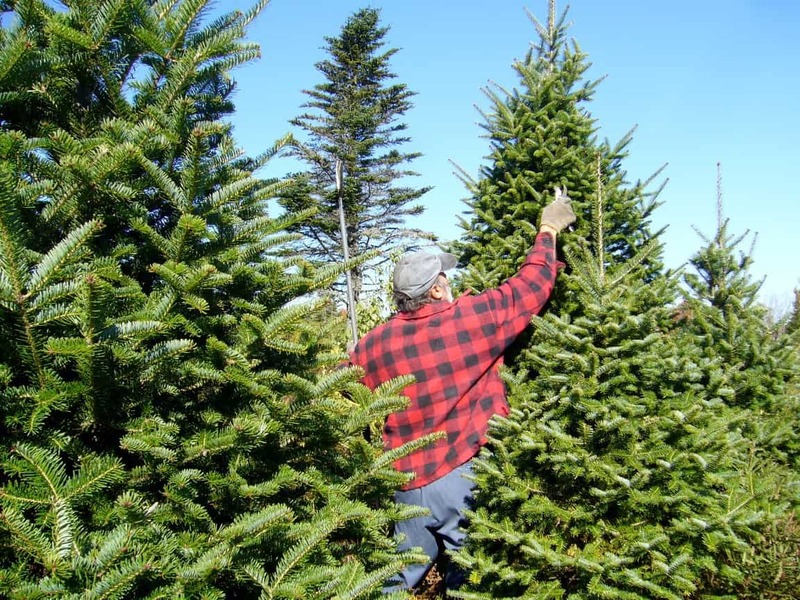 Real trees support local farmers and boost the regional economy. Most artificial trees come from China and are sold by big-chain retailers. They are also made from harmful PVC and can contain enough lead to require a warning label. On the downside, real trees are usually treated with artificial fertilizers and pesticides. Real trees are grown on plantations where the land could be used to grow more useful crops or given over to nature. 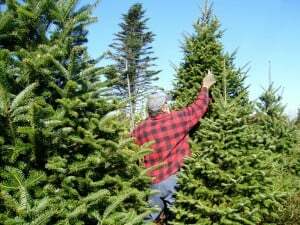 However, many Christmas trees are grown on land that is fairly marginal for other agricultural uses and they do provide quite a reasonable habitat for some species including several birds. A much greener choice than buying a cut real tree or cutting one yourself is to bring in a living one in a pot. The problem is that even trees with a good root system that are brought indoors suffer environmental stress and will only stay healthy for about a week. They cannot then be planted out until the spring thaw and in the meantime you have to protect the root ball from frost if they are to re-establish themselves successfully. Whether you choose real or artificial you really should opt for LED lights because they use 90% less electricity, last longer and are made with fewer toxic chemicals. The greenest choice of all is to break with tradition, not bother with a tree and just decorate a few branches instead. But you may not feel this is really in the spirit of the season!